» Addenda to CRIME FICTION IV – Colin Forbes & Miles Tripp. Addenda to CRIME FICTION IV – Colin Forbes & Miles Tripp. Taken from Part 27 of the ongoing online Addenda to the Revised Crime Fiction IV, by Allen J. Hubin. The work of only two authors is cited in this posting, but with the number of pen names each of them had, it may make it seem as though there were more. BRETT, JOHN MICHAEL. 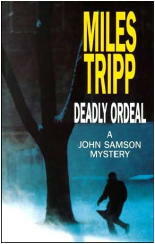 Pseudonym of Miles Tripp, 1923-2000, q.v. 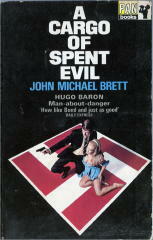 ; other pseudonym: Michael Brett, q.v. Under these two pen names, the author of three adventures of Hugo Baron, an agent who works for a British organization called Diecast. A Cargo of Spent Evil. Barker, UK, hc, 1966. SC: Hugo Baron. Add setting: England, Germany. [On this assignment Baron poses as a Neo-Nazi sympathizer.] Shown is the cover of the reprint Pan edition. A Plague of Dragons. Barker, UK, hc, 1965. SC: Hugo Baron. Setting: Africa. BRETT, MICHAEL. Pseudonym of Miles Tripp, 1923-2000, q.v. ; other pseudonym: John Michael Brett, q.v. Diecast. Barker, UK, hc, 1964. Gold Medal, US, pb, 1963. Add: also published as by John Michael Brett: Pan, UK, pb, 1966. SC: Hugo Baron. FORBES, COLIN. Pseudonym of Raymond H. Sawkins, 1923-2006, q.v. ; other pseudonyms: Jay Bernard & Richard Raine. Born in London; served in North Africa in World War II before joining a publishing and printing firm. Under this pen name, the author of over 30 novels of espionage, action and adventure. Appearing in many of them is a man called Tweed, the Deputy Director of the Secret Intelligence Service. For a long article on Forbes after his passing by Iwan Morelius, a long-time friend, see this earlier post on the Mystery*File blog. The Janus Man. Collins; UK, hc, 1987. Harcourt, US, hc, 1988. SC: Tweed. Add setting: Europe. [Tweed hunts a killer working on Moscow�s orders; one of four European section chiefs is working for the other side.] 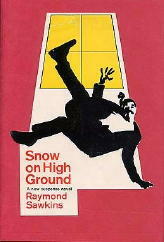 Shown is the cover of the reprint Pan edition. SAWKINS, RAYMOND H. 1923-2006. Pseudonyms: Colin Forbes, q.v., Jay Bernard & Richard Raine. 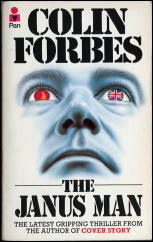 Best known for his works of espionage, mystery and adventure under the Colin Forbes byline. Under his own name, the author of three detective novels featuring Supt. John Snow. One of these is shown below (Heinemann, 1966). TRIPP, MILES. 1923-2000. Pseudonyms: John Michael Brett, Michael Brett, qq.v. Born in England, served in RAF Bomber Command during World War II. Studied law and admitted as a solictor in 1952. Under his own name, the author of over 30 crime and detective novels included in the Revised Crime Fiction IV. Fourteen of these featured a private eye named John Samson; one of these is shown below (Severn House, 1999).